Decarboxylation is the process of turning the psycho-inactive THCA (THC acid) into just plain old psychoactive THC. This is done by very carefully and precisely heating flower product to 220 degrees or 104.44 celsius. The exact duration will depend on the quantity, how finely the product is ground and it’s freshness. For pre-dried product decarbing may only take 30 minutes. For juicier, fresher product it could be upwards of an hour. Decarbing is an essential chemical reaction for turning raw, unprocessed cannabis plant into psychoactive sellable material. Outside of heating there is a second way to decarboxylate marijuana and that is via aging or curing. Curing weed is more of an art than a science, as there are numerous uncontrollable variables such as air temperature, humidity, starting moisture content of the organic material etc. Aging is a fun way to experiment with smaller quantities of cannabis but for consistent, reliable and scalable decarbing heating is the industry’s preferred method. Different compounds decarb at slightly different temperatures and of course, there is a “point of diminishing returns” when too much heat actually starts to degrade the product. Decarbing is not a mono-linear process. Different temperatures and durations activate different cannabinoids and terpenes in different ways. The chart below shows at what temperature various compounds become active. While decarboxylation is a scientific process there is also still a bit of art to it, especially in terms when it comes to producing a very specific final product. For example, many companies aren’t interested in maximizing only active THC content, they may be more interested in maximizing cannabinoid content or even very specific terpenes for health/therapeutical reasons. Thus, it is always good to first test a temperature and time duration with a small amount of organic material first to dial in the process required to achieve the desired end product. Decarbing has been done in the pursuit of edible nirvana for centuries, much of it more of an art form than any kind of science. This haphazard approach while successful, has also resulted in end products that vary widely in their psychoactive potency and therapeutical benefits. With the advent of modern technology this cooking tradition can now be done with precision at the consumer level with precision heating devices like the Ardent Decarboxylator. On the commercial side companies like Thermo Fisher, Shel Lab, and Precision Quincy offer up industrial sized baking solutions with precision temperature control for consistent and reliable decarbing. Home decarbing is great for cannabis lovers who are looking to get into edibles or just want to try a new way of enjoying the magical plant. Edible equipment pioneer Ardent has made a personal-sized precision decarboxylator for home and personal use called the Nova. Available in both 110v for U.S applications and 220v for international applications this handy little chemistry lab. With a form factor resembling a small blender or large coffee grinder the Nova is a great solution for home bakers, epicurean adventurists, chefs, and even small bussiness owners and startups. The small form makes it the Nova a great solution for experimentation, allowing users to decarb a large variety of flower in small batches quickly and reliably. The greatest benefit of the Nova is the preset heating programs. As illustrated in the above chart, there are a wide variety of temperature and cooking durations that can have a drastic impact on the marijuana plant. Cooking too long can destroy the very compounds that users are seeking to extract from their organic material. With the Nova, that is not a worry. The pre-set heating temps and durations ensure no weed will be wasted in your pursuit of edible eden. For home-use, for chefs, and for entrepreneurs looking to refine their early stage product, the Nova is a n0-brainer purchase. For those who already have a product and need to scale up their business there are other, larger commercial solutions available. Decarbing at scale is about volume and precision. There are dozens of commercial oven manufacturers out there but 40% of them are designed specifically for industrial/non-consumable use (drying plastics, paints or other chemicals). What’s more another 40% of commercial ovens that are designed for human consumable foods are engineered with bakers and chefs in mind. This means temperature control is accurate but not precise and focus is more on speed and access. Only about 20% of commercial ovens are suitable for decarbing marijuana, and of them only a handful have a reputation for quality construction, user support and long-term reliability. Below are the 3 most popular commercial ovens that are used for small business and commercial decarboxylation. Thermo Fisher Scientific is the gold standard in industrial-grade, industry-leading scientific cooking, extraction and processing machinery. With a long history of both reliability and precision, trusted by some of the worlds largest pharmaceutical and engineering firms. Thermo Fisher is a no-brainer for cannabis entrepreneurs who value quality and reliability in their machinery. Out of their product line the Precision series ovens are most suited for decarbing purposes at the commercial/industrial level. Thermo Fisher Precision ovens have temperature controls to within plus or minus .5 degrees celsius, allowing for precise baking on a consistent basis. The Precision ovens have built-in LED displays for temperature and a mechanical timer for precision and reliability. Ovens are also air-tight and constructed out of stainless steal for easy cleaning and minimization of external scent leakage. Precision ovens come in sizes ranging from 39.6 liter capacity all the way up to big daddy sizes of 269 liters. These ovens are already popular with chem labs and are the gold standard in the tobacco industry. We foresee them being a leader in the emerging cannabis segment as well. Shel Lab is short for Sheldon Labs by Sheldon Manufacturing. They are an ISO 9001:2008 company producing a variety of ovens, water baths, humidity cabinets and complimentary equipment for precision manufacturing industries. Based in Cornelius Oregon they stand to be one of the greatest contributors to the local booming legal cannabis industry as decarboxylation is the first step for many popular cannabis products that are popping up all over Oregon. Shel Labs has a wide variety of oven types, with the most applicable for decarbing being their vacuum ovens, high-performance ovens and forced air ovens. The Shel Lab vacuum range comes in both .6 cubic feet and 1.7 cubic feet capacities and have temperature accuracy within .5 degrees celsius. For more volume/capacity there is the Shel Lab High Performance line. These ovens range from 10 cubic feet all the way up to 38 cubic feet, which means they have your business covered at all stages of growth. Ovens come with a 24 month warranty which make them a solid business investment for a cash-strapped edibles or extracts business looking for reliable, dependable and scalable industrial decarbing solutions. 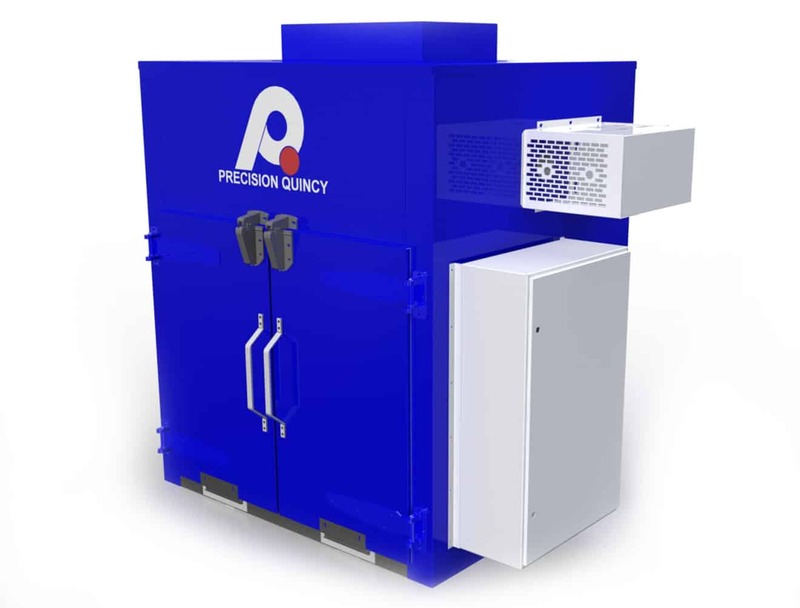 Precision Quincy is a 70 year old American manufacturer of some of the biggest industrial ovens available in the United States and Europe. They have smaller ovens perfect for startups all the way up to massive walk-in ovens for companies that need to decarb massive amounts of cannabis product at scale. One of the unique advantages of Precision Quincy is their versatility in how their ovens can be configured. Essentially, you go to PQ and tell them your needs and they come up with a custom solution for you. This is a great solution for business owners lacking in technical expertise who want to focus on their product and business growth without becoming an electrical engineer over night. In fact, Precision Quincy has an entire oven range dedicated to “curing”. This range starts with cabinet style ovens and goes all the way up to massive walk-in industrial curing ovens. Temperature range stability is within 10 degrees fahrenheit for maximum consistency for operations that require long heat cycles like decarbing. Because of their sheer selection of sizes and their traveling support/engineering team Precision Quincy is a great solution for established companies looking to take their edibles or extracts business to the next level by decarboxylating commercial volumes of plant material.